Building, post by post. | House by the water. Looking into our future. Landscape design by Tim Davies Landscaping. I’ve been thinking out loud here on this blog for one year now. There has been some dilly dallying by me and plenty of advice from you. The blog has been viewed over 14000 times, mostly in Australia, but with peeps in over 70 countries. (It’s going to be a big house warming party.) On average, 30 different readers pop by each day (more than 70 hits) – so not just my Mum, after all. But, the best bit about blogging is receiving comments. Your comments have helped me make quite a few decisions. I love that readers outside of W.A. prompt me to think “outside the box” for options and solutions, and I love that readers inside W.A. provide local tips and advice. If you comment, don’t forget to check back later for my reply and the comments of others. I bought the blog a birthday present! Did you notice? If you are not a WordPress member, you will have had pesky little ads coming up at the bottom of my posts. That was the result of me not paying to use their clever blogging platform. House By The Water is now 100% ad free. My favourite post: The Kitchen Bench. The most popular post: Exterior Colours. The post receiving the most comments: The Splash back is back! You might think that after one year there would be something to show for all this planning. The thing is, we don’t want the house to be finished too soon before we return to Australia in late 2015. In fact, we put in our preliminary plans agreement (PPA) that the house should not be completed before July 2015. So we are going to be patient. I am grateful for our luxurious time line. I can’t imagine how some people can make all the decisions required in the few weeks between signing up for building a home and the work actually starting. For example, just picking a fireplace took me two weeks. I’m expecting to see some action on the block in May. In the mean time, I’m sure we’ll find something to talk about. 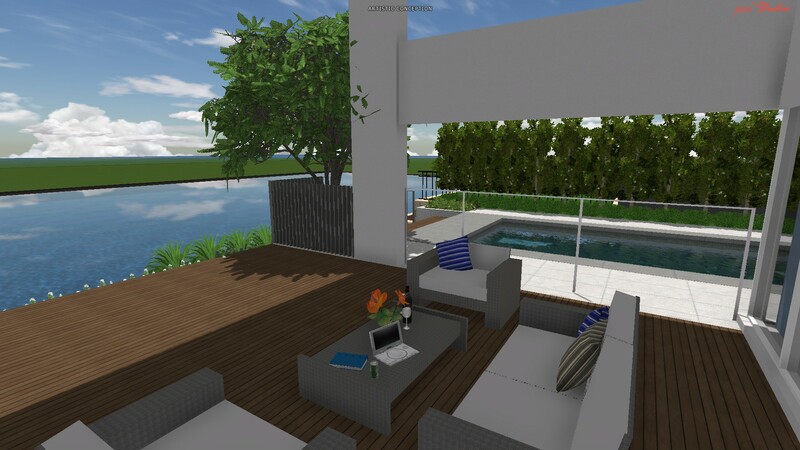 It didn’t take our Landscape Architect long to figure out his client – glass of wine and laptop on the deck, looking out across the canal. Tim Davies Landscaping. 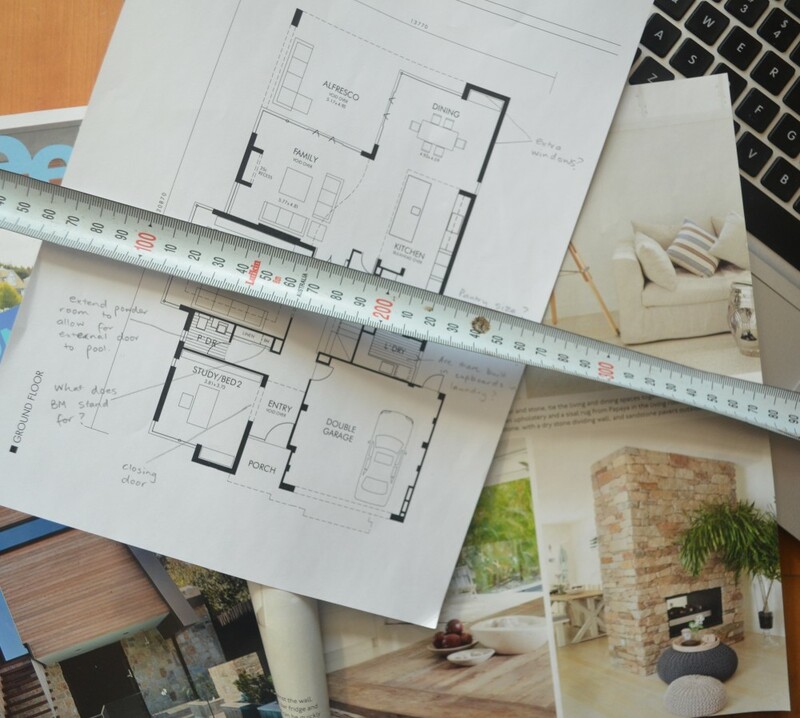 All that planning should find you in really good stead once things get going on site – looking forward to seeing it going up? Have you resolved your site visit issue yet? You have been so thorough Jo and obviously enjoyed all the planning. I am sure your home is going to be absolutely stunning. Looking forward to the house warming party in 2015 !!! Some people need to read the newspaper every morning but I like my early morning ‘catch up’ on the House by the Water. 14000 viewings is amazing and I must admit your mum might have been one or two of those hits each day. Hope we are still going to get little snippets from time to time. Which reminds me, I found a couple of nice fences recently so I’ll send you some pics. It’s interesting to look back and see what you’ve accomplished. Will have to go back and read those posts I probably missed! 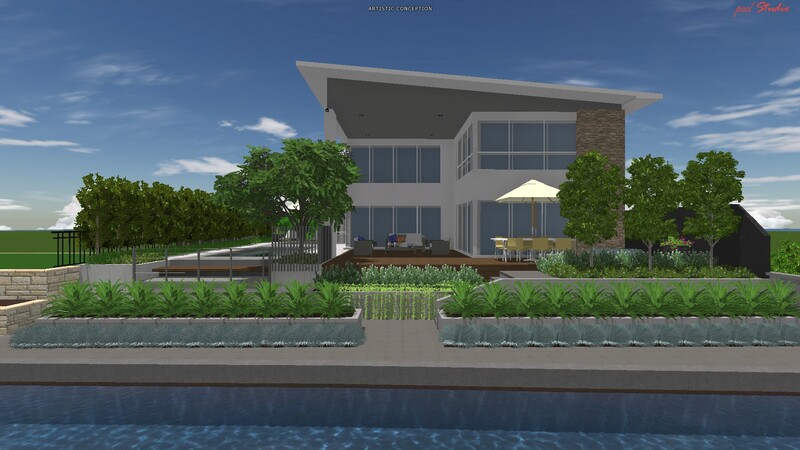 We have sold our old house, chosen a builder and house plan, chosen a landscape architect and design and made most of the decisions (including many worth tens of thousands of dollars – floors, roof line, pool, air con,) over the past year. Now we will start to see the results of all that. I’m so glad we can compare notes!